Long ago, outside the old city of Singapore, which was considered to be the city of Lions, there was reported to be giant brown beasts. This was before the Asiatic lion was reduced to such low numbers that their are now less than 200 left in the Gir forest. This huge animal might just be an explanation for this myth, for he is neither a lion nor a tiger, but he is about the size of both of them combined. 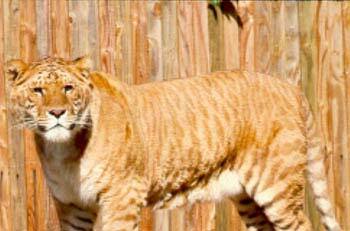 The liger is the world's largest big cat. An average male liger weighs over 900 pounds and standing almost 12 feet tall. The reason that they are called a liger is because the father was a lion and the mother was a tiger. If the situation was reversed and the mother was a lion and the father was a tiger, he would be called a tigon, and would be a dwarf instead of a giant. 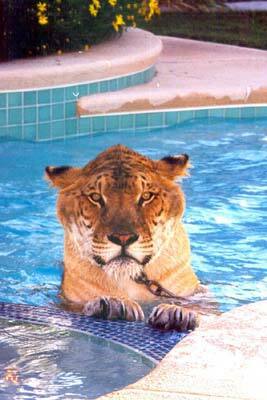 A fully grown tigon is usually less that 350lbs. Ligers are not sterile, and they can reproduce. If a liger were to reproduce with a tiger, it would be called a titi, and if it were to reproduce with a lion, it would be call a lili. Ligers are not something we planned on having. We have lions and tigers living together in large enclosures. We had no idea how well one of the lion boys was getting along with a tiger girl. Low and behold, she had giant brown babies, and we knew we had ourselves some ligers. Our ligers were raised on a baby bottle, and they still enjoy getting them as treats. They are not tame from these activities, they are trained to behave. They will still bite or even kill someone given the right set of circumstances. Our liger could easily eat a hundred pound of food in a sitting but they tends to gain a little extra weight so we feed them about 25 pound of food a night. People often ask what our big cats eat. They love to eat something called, King Lion diet, which is made basically by taking a horse, a cow, a couple of pigs and a flock of chickens and putting them into a blender on high with all they parts and pieces. This ends up looking like a raw bloody meatloaf. They also enjoy restaurant quality chicken thigh quarters and chunk beef.